Refits of retro TVs and radios with the latest smart guts are a dime a dozen around Hackaday. And while a lot of these projects show a great deal of skill and respect for the original device, there’s something slightly sacrilegious about gutting an appliance that someone shelled out a huge portion of their paycheck to buy in the middle of the last century. 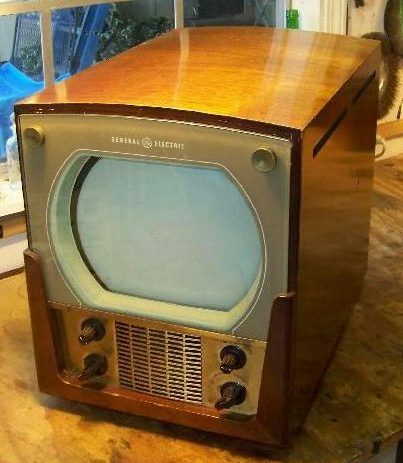 That’s why this all-new retro-style case for a smart TV makes us smile. Another reason to smile is the attention to detail paid by [ThrowingChicken]. His inspiration came from a GE 806 TV from the 1940s, and while his build isn’t an exact replica, we think he captured the spirit of the original perfectly. From the curved top to the deep rectangular bezel, the details really make this a special build. One may quibble about not using brass for the grille like the original and going with oak rather than mahogany. In the end though, you need to work with the materials and tooling you have. Besides, we think the laser cut birch ply grille is pretty snazzy. Don’t forget the pressure-formed acrylic dome over the screen – here’s hoping that our recent piece on pressure-forming helped inspire that nice little touch. This project was clearly a labor of love – witness the bloodshed after a tangle with a tablesaw while building the matching remote – and brought some life to an otherwise soulless chunk of mass-produced electronics. Live in Kentucky? Want to invent the next big thing for the kitchen, like the automated ice maker? Well, you’re in luck. GE is hosting a massive hackathon at their microfactory called FirstBuild which is located in Louisville, Kentucky. Unfortunately it looks like pre-registration is already closed. The concept of FirstBuild is pretty cool. GE has created what they like to call a microfactory for innovating new products in small production runs to flush out good ideas. We’d call it more of a corporate hackerspace with some serious funding. Regardless of their motives, it’s still a cool concept. And they have some awesome toys, er, tools. The event is being sponsored by lots of big names like Intel, Atmel, TI, Freescale, MakerBot and even Autodesk — and the prizes aren’t too shabby either! Though for the really big prizes you’ll need to stick with us. We have to wonder — what happens when GE sees an idea they like? Hopefully it results in a sweet job. A plane from Britain is met in the US by armed security. The cargo? An experimental engine created by Air Commodore [Frank Whittle], RAF engineer air officer. This engine will be further developed by General Electric under contract to the US government. This is not a Hollywood thriller; it is the story of the jet engine. The idea of jet power started to get off the ground at the turn of the century. Cornell scholar [Sanford Moss]’ gas turbine thesis led him to work for GE and ultimately for the Army. Soon, aircraft were capable of dropping 2,000 lb. bombs from 15,000 feet to cries of ‘you sank my battleship!’, thus passing [Billy Mitchell]’s famous test. The World War II-era US Air Force was extremely interested in turbo engines. Beginning in 1941, about 1,000 men were working on a project that only 1/10 were wise to. During this time, American contributions tweaked [Whittle]’s design, improving among other things the impellers and rotor balancing. This was the dawn of radical change in air power. Six months after the crate arrived and the contracts were signed, GE let ‘er rip in the secret testing chamber. Elsewhere at the Bell Aircraft Corporation, top men had been working concurrently on the Airacomet, which was the first American jet-powered plane ever to take to the skies. In the name of national defense, GE gave their plans to other manufacturers like Allison to encourage widespread growth. Lockheed’s F-80 Shooting Star, the first operational jet fighter, flew in June 1944 under the power of an Allison J-33 with a remarkable 4,000 pounds of thrust. GE started a school for future jet engineers and technicians with the primary lesson being the principles of propulsion. The jet engine developed rapidly from this point on. It’s almost a week since the NYC Maker Faire, and it’s about time for us to start wrapping up all the posts we’re doing on everything we’ve seen. [Chris Mitchell], hackaday favorite from Cemetech did what he always does at Maker Faire: brought some stuff he’s doing with TI graphing calculators. The TI-84 with GPS made a showing, as did the graphing calculator IRC client. By far the coolest looking calculator was the wooden casemod. It’s a TI-82 put into a (what feels and looks like) a maple enclosure. The buttons are painted on, and despite stuffing consumer electronics into a handmade case, it’s still reasonable portable. There were more Hackaday fans at the faire, but I’m not sure if anyone can beat the guys from Protopalette. Wait. One guy could. Find me in public sometime and I’ll tell you about that. The Protopalette is a board with a bunch of lights, buttons, switches, sensors, knobs, servos, and buzzers for electronics prototyping. Think of it as a stylized version of the old ‘parts and springs and wire’ radio shack beginner electronic kits. Some of the members of the hackerspace with the craziest group narrative, LVL1 in Louisville, made it to the faire. They’re working with GE to create a ‘maker module’ for appliances. It’s called Green Bean, and GE is actually building support for this into some of their fridges, washers, stoves and dishwashers. There are a few modules already, like a scale that will send out a message when you’re out of milk. It’s an interesting system, and there are already a lot of appliances that support the system. I’ve been on vacation and managed to get a day to play at the GE Garage mobile fab lab currently setup in downtown Chicago. GE has partnered with Chicago Ideas Week to bring the future of fabrication technologies to a space where the community can walk in off the street and work with some amazing hardware like CNC mills, laser cutters and 3D printers. The group is also giving classes at select times on using the equipment and general electrics. Unfortunately I was in town near the end of this event which will be Oct 20th. If you are in the area I do recommend jumping on the excellent transportation you’ll find in Chicago and have some fun at the space. Here are more details on location, classes and times. I didn’t expect to squeeze any work into my vacation but I did take a guided tour of the fab space with my iPhone 5s. You can join me after the break to watch the tour, which is a bit rough but still covers a lot of fun topics. Get at look at their line-up or Replicator 2 3D printers. See some fantastic prints from metal made on industrial scale printers. 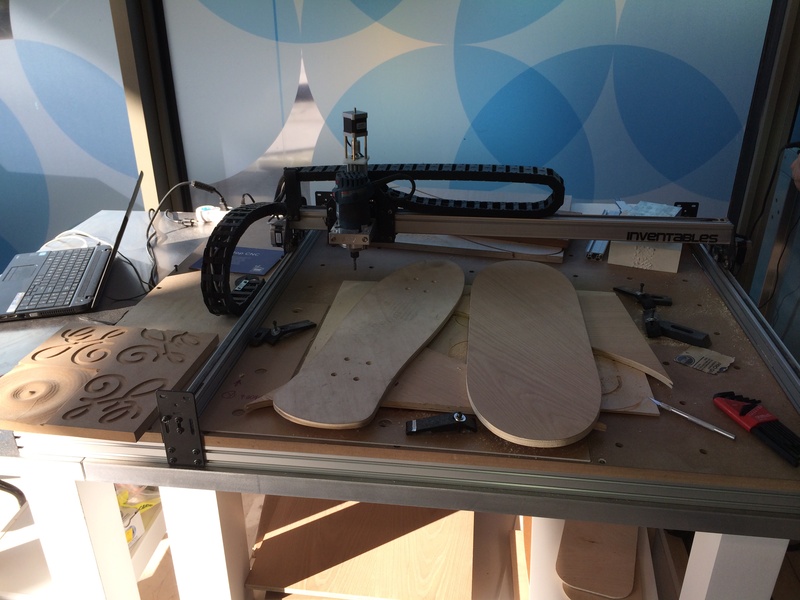 Learn more about the up-scaled CNC seen above that was cutting out skateboard decks. And finish up with an injection molding machine.